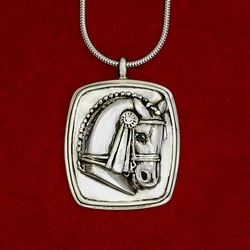 Sterling silver Dressage horse necklace is perfect for the dressage enthusiast. Select your choice of a 16″,18″, or 20″ sterling silver chain. 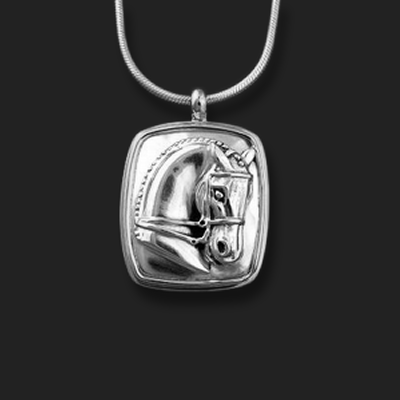 This sterling silver Dressage horse necklace is a true design that represents the essence of this classical horse discipline. 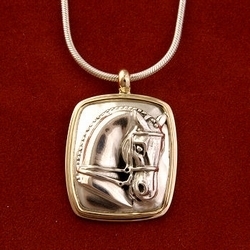 This horse pendant is a 3 part construction and can also come with a 14k frame or 14k head with sterling frame. Made by my master silversmith this piece is first cast…the frame separate from the head…..then assembled and a piece of sterling sheet is added to the back.. then the bale that holds the chain is made by hand and added. Hand polishing completes the process and finished look. 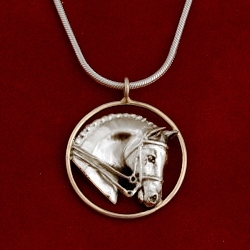 This horse necklace is available on a 16″, 18″, or 20″ sterling silver snake chain with a nice size lobster clasp. 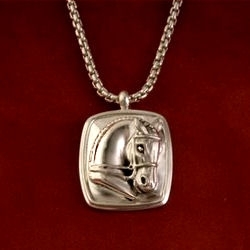 This horse head design is a perfect gift for the horse lover who specializes in the art of dressage. Don’t forget to get a pair of matching earrings.